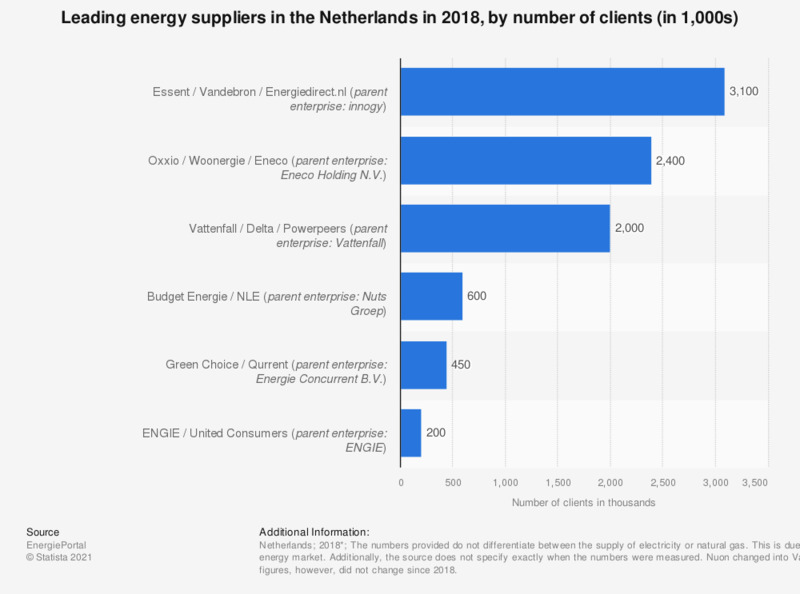 This statistic shows the leading energy suppliers in the Netherlands as of June, 2018, by number of clients (in thousands). As of 2018, there are 47 private energy companies active in the Netherlands. As of 2018, Essent and Energiedirect.nl, both brands from German-based innogy (a subsidiary of RWE), reached a total number of clients of around 3.1 million. Dutch company Eneco, together with its subsidiary Oxxio, reached 2.4 million clients. Market data for energy suppliers in the Netherlands is something domestic sources struggle with to collect. This because the energy market in the Netherlands works differently than, for example, in Belgium or Luxembourg. In 2004, the government in the Netherlands liberalized the supply of electricity and natural gas, allowing more energy suppliers to enter the market. As these companies don't have to openly share their data, the exact market shares are difficult to determine. This is different from the Netherlands' neighboring countries, where companies have to share their data with the local authorities. * The numbers provided do not differentiate between the supply of electricity or natural gas. This is due to the organization of the Dutch energy market. Additionally, the source does not specify exactly when numbers were measured.